This product does use some good ingredients although, it seems to lack clinically proven ingredients and patented ingredients and this suggests that it may not be an effective day serum. 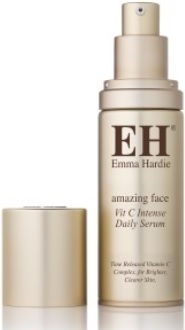 Read the following informative product review for Emma Hardie Vitamin C Intense Daily Serum to explore all the real facts. The manufacturer claims that this product will nourish, hydrate and revive your skin while also providing antioxidant protection. Furthermore, it will improve your skin’s general appearance by brightening skin, reducing pigmentation, age spots and skin damage. Benzyl Benzoate – can be used to treat skin conditions and skin irritations. Propanediol, Dicaprylyl Carbonate, Glycerin, and Caprylyl Glycol are beneficial as skin conditioners and emollients. Niacinamide is a form of Vitamin B3 used as a skin-restoring ingredient to improve the appearance of aging skin. Coco-Caprylate/Caprate works as an emollient that may reduce the appearance of wrinkles. Ascorbyl Glucoside is beneficial as an antioxidant. Hydroxyacetophenone may assist as an anti-irritant and an antioxidant. Palmaria Palmata Extract may contain skin conditioning and protecting properties. Hydrogenated Lecithin is beneficial as a moisturizer that may also help treat eczema. Caprylyl Wheat Bran – can be used to help cleanse skin and absorb excess oil. Palmitic Acid may have antioxidant properties and contains a beneficial source of vitamin E. Sodium Cocoyl Glutamate – is beneficial for skin cleansing. Glyceryl Caprylate may help restore oils to the skin. Tocopherol and Limonene work as antioxidants. Citral is beneficial as a synthesis of vitamin A. Benzyl Benzoate can be used to treat skin conditions and skin irritations. Effective day serum products contain a minimum of 10% active ingredients and 5 patented ingredients that are clinically proven, and it is disappointing that this product does not seem to meet these requirements and therefore, it may not be effective. Pentavitin and Pepha-Tight are just two of many different patented ingredients that are clinically proven to effectively enhance the health of your skin and we recommend that you should rather consider products that contain these ingredients. The manufacturer recommends that you should warm one to three pumps of the serum in your hands and then apply it to your face after you have cleansed in the mornings and again in the evenings. It is additionally suggested that you should moisturize after using this product. This product can be purchased online from the manufacturer’s website and one bottle will cost you $62.82 but unfortunately, it is currently out of stock for an indefinite period of time which is extremely inconvenient. The manufacturer does not offer a money back guarantee for this website and further inspection of their website suggests that they do have a return policy although, the provided information states that they will not refund opened and used products. This product does use some good ingredients although, it seems to lack clinically proven ingredients and patented ingredients and this suggests that it may not be an effective day serum. There is no manufacturer’s guarantee which is extremely concerning as this questions the effective results and furthermore, it is also a rather pricey product that it not even available to purchase for an indefinite period of time and therefore, it is not a suitable option and we suggest that you rather opt for a more effective product that is available from leading brands. Next: Agelyss Age Defying Day Serum Review: Is it Safe and Effective?